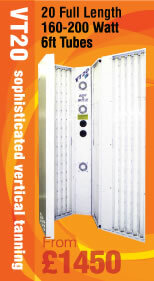 This classic sunbed has been around longer than us... and it is still a very popular sunbed. It is great for a relaxing peaceful tanning session. With 8 x 100 watt RUVA 6 ft tubes it's easy to obtain that bronze look for your wedding or Christmas party, or to provide you with that base tan before you go on holiday. The sovereign bed comes on a metal stand with small wheels on the base. So you can push it over your own bed when it's needed and move it out the way when you have finished. The stand is also adjustable to suit your bed height. When your session is over it can be stood in an upright position in the corner of the room out the way. Free delivery and installation for periods of 4 weeks or more.